I'm wrapped up in the cozy blanket of knowing that I have no real commitments today! Except grocery shopping, but that I do at my leisure and, if I time it right, I get home with a van full of purchases and a teenager just off the bus and anxious for a treat. He brings in the groceries, I let him have a snack and my work is done! Supercalifragilisticexpialli-easy! That's what I hate most about grocery shopping--bringing in the groceries. It wasn't bad when the kids were very little and there were fewer of them...oh, let's face it, YES it was bad. There weren't many bags to bring in, but I had kids screaming for food, consolation, lost toys, lost blankets, naptime (although they didn't know a NAP was needed) and screaming because I wasn't paying attention to THEM. And grocery putting-away had to happen quickly or the ice cream would melt. Oh yes, random picture. (heehee, that wasn't it, but it is now). In fact, TWO random pictures! 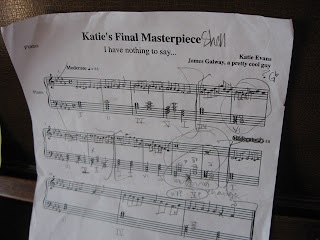 This first one is part of Katie's Music Theory 1 final. She has to write a little song 16 bars long involving melody in right hand and triads in the left. Easy-peasy, she says. 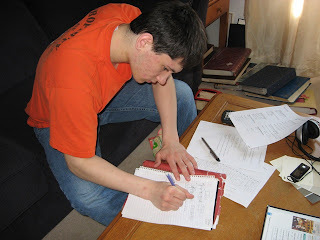 And this is Jimmy, ridding the world of un-identitied trigonometry problems. *Post title comes from a TV show that lasted only 9 episodes--"The Tick." It starred Patrick Warburton, affectionately known in our household as "Kronk." We LOVE "The Tick." And by "we" I mean I. And Jimmy and Paul. Wow, writing songs. I can do that, but they usually incorporate the music from some well-known song with really cheesy words about my kids.